November was the month of housing strategies. In an unusually coordinated fashion, all three levels of government are staking out their positions on the housing portfolio. Vancouver and Ottawa have released official housing strategies while the BC government is promising more details in their February budget. I'm only going to talk about the CoV strategy today. The City of Vancouver has adopted a Housing Strategy for the next 10 years. Several people, like Paul Kershaw (Generation Squeeze) and Steve Quinn (CBC), have expressed cautious optimism. I'm in agreement. The plan has a lot going for it. In the plan, The CoV finally recognizes that housing prices are an issue for the majority of Vancouverites. This is a shift from their previous focus on assisting only the most economically marginalized. The plan has details on how to address both the demand and supply sides of the housing equation. Taxes and other policies that encourage living in the homes. Examples include the empty homes tax and the AirBnB regulations. Clarify land use policy that discourages land speculation and stablizes price growths going forward. Gather more data to understand where demand is coming from. The third point is promising. We like to blame foreign money but it's hard to know the breakdown of foreign versus local money. A recent article over at Better Dwelling points to a big rise in second mortgages in Vancouver. One possibility is existing owners withdrawing equity to put a down payment on a second unit. Without peeking at the true ownership data, it's hard to know how much speculative demand is our own fault. 62,000 new units for households making less than $80,000 per year. For reference, there were 309,418 units in the City of Vancouver according to the 2016 census. Attempting to create "Rental Only Zones". This would help provide security of tenure, one of the oft cited benefits of owning, to the the city's renting population. Fun fact, I was shocked to find out that 53% of the city's population is renting. OK enough with the chatter, stats here we come! Prices are down again in November and listing volumes have picked up. Volumes are up 4.18% month-over-month in November to 5078 listings. 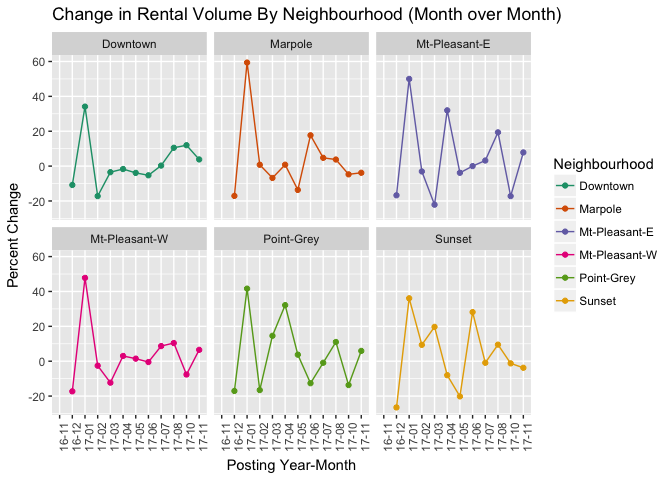 Marpole and Sunset saw a -3% tightening in listings, but all other major neighbhourhoods got more supply (Downtown +3.8%, Mount Pleasant +7% and Point Grey 6%). 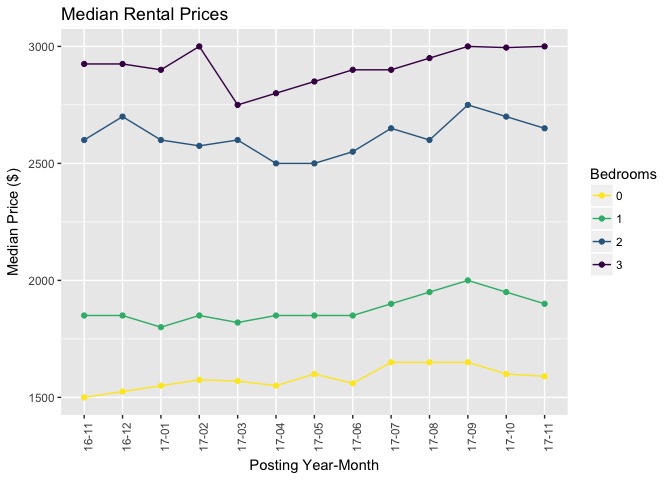 Median prices are also moderating along with the increased volume. Studios are roughly the same at $1590 versus $1600 last month. One bedrooms and two bedrooms are down $50 a piece to $1900 and $2650 respectively. Three bedrooms are up a sliver to $3000 though. November is a big month because we finally have year-over-year data! 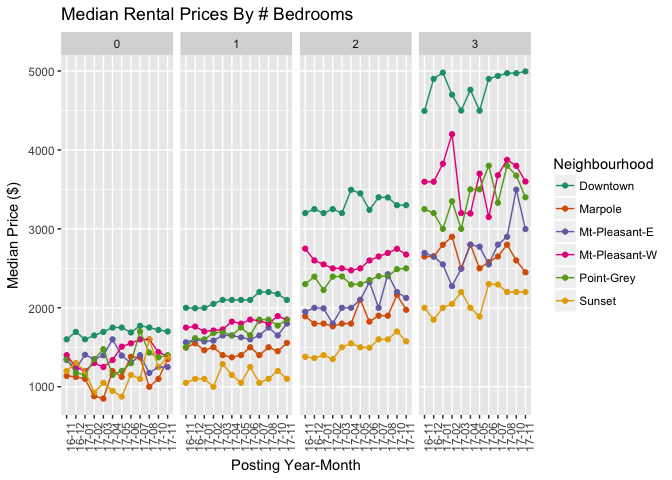 In general, rental costs have gone up between 2% and 3% depending on the number of bedrooms. Studios were an outlier with a 6% increase, possibly due to newer units coming online. 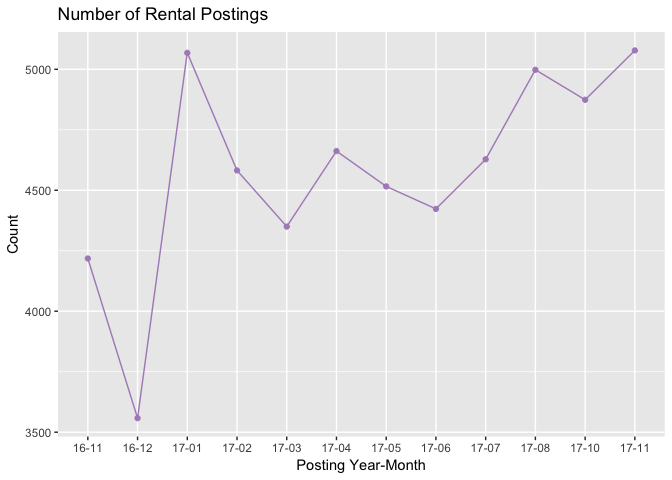 Remember those panic-inducing rental increases over the summer that drove one-bedrooms median rents to $2000? It looks like they were seasonal. Whew.